“The Everyday” also makes more human a world that is often regarded as unknowable. Years ago, as a television and radio major at Brooklyn College, Kells tried to land a major internship the summer following graduation, but without success. As he contemplated his empty, post-college summer, his professor, Sister CAMILLE D’ARIENZO, recommended a residency program at Mount Savior that takes a small handful of students at a time. Six hours from Brooklyn in Pine City, N.Y., the monastery’s guesthouse helps generate income. For the program, however, Kells lived on the monastery proper, sharing the patterns and learning the values of the monks, and rising at 4:45 each morning for the first prayers. The last weekend Kells and McGinn visited Mount Savior, they shot only four hours of film, but the final hour is composed mostly of that footage. Their vision had melded. The monks’ day is organized around seven prayer services, so the film keeps returning to the chapel, portraying both a day in the life and a year in the life, and revealing how the monks’ impact reaches beyond the hills. Kells was surprised to make back the money he put into the project for gas and rentals (“we never expected to make a penny”) and has since turned over all proceeds to the monastery where the DVD still sells regularly. “The Everyday” has been aired about 15 times on a dozen local PBS stations, and won a New York Emmy for Long Form Camera and Audio. 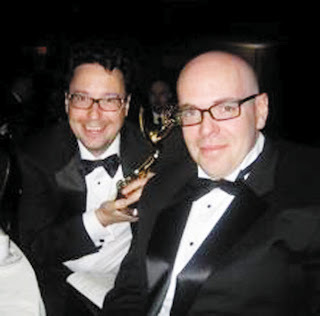 Bed-Stuy resident CHRIS WARD was the sound editor; Kells was especially thrilled for him and McGinn to win Emmys because they had volunteered their time to the film. Prior Martin Boeler even came to the Emmys — in a suit. Father MICHAEL PERRY, the priest who helped run the summer program at the monastery, was the officiant who later married Kells and his wife, Catherine, and baptized their baby, Fiona. Sister Camille, who encouraged him to go to Mount Savior, provided the voiceover for “The Everyday.” She is a broadcast professional for 1010 WINS and elsewhere. Kells often films for Channel 13. One point in his company’s mission statement neatly summarizes his inspiration: “We believe, firmly, that good stories are all around us, waiting patiently for their tellers.” To watch or purchase “The Everyday,” visit www.spookytruth.com. BRENDAN J. DUGAN will soon be officially installed as the 18th president of St. Francis College with a series of events from Sept. 29 to Oct. 2, the day of the formal convocation. Following that 9 a.m. ceremony, there will be a gala reception at Steiner Studios in the Brooklyn Navy Yard. When his sister, Assemblywoman EILEEN DUGAN (D-Brooklyn), died of cancer in 1996, days after being sworn into her ninth term, Dugan decided to honor her life by establishing a scholarship at St. Francis in Eileen Dugan’s name. He received his Bachelor of Business Administration there in 1968, an experience he still remembers fondly and with appreciation. 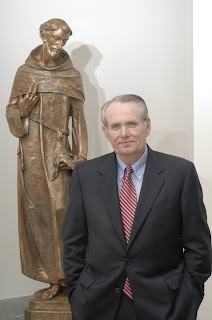 Outgoing President FRANK J. MACCHIAROLA (’62) is stepping down after 12 years of leading St. Francis.